Guess what today’s topic is going to be? 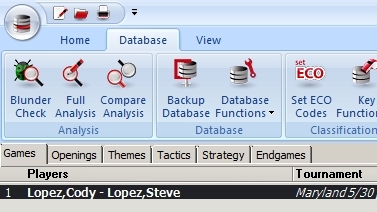 The first step is to create a database in which to store your games. This was described in the previous post to this blog; just as a reminder, go to the Application Menu and select New → New Database. Select the folder in which you want the database saved, name it, and click “Save”. Now you can start entering games by hand. You’ll want to double-check to make sure you’ve selected the correct database. Hit F12 to open the game list window, go to the Application menu, and either select the proper database from the “Recent databases” list or click the “Open” command and use the File select dialogue to go to the folder where you saved that database and then double-click on it to open it. Now you’re ready to start making moves on the chessboard. 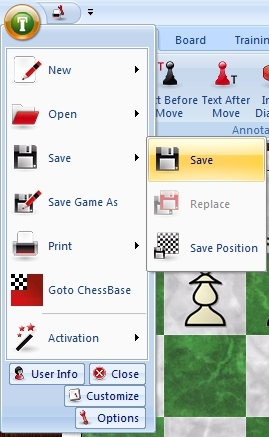 To move a piece or pawn, just grab it with the mouse – hold the mouse cursor over the chessman, then click and hold down the left mouse button. Move the cursor over the destination square, and then release the left mouse button to drop the piece onto the board. Enter as much of the information as you can (or wish to). Remember that names should be entered in [Last name/first name] format as shown in the illustration above. The “Date” will need to be changed, as it always defaults to the current date (that is, the day you manually input the game). 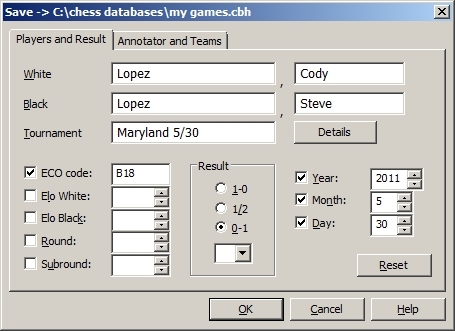 The ECO (Encyclopedia of Chess Openings) code will be filled in automatically by the software. If you don’t understand the “Result” selections, “1-0” signifies that White won the game, “1/2” means the game was drawn, and “0-1” is a Black win. And, if you look at the entry in the game list and realize that you’ve made a mistake (such as marking the game as a White win when Black actually won – this, by the way, is a very common error), just single-click on the game in the list to highlight it, then hit the F2 key on your keyboard. This brings the header into dialogue back up again; just make the changes and click “OK”. That ought to keep you busy for a while; when I got my first copy of Fritz (the first version, back in the old DOS days when Fritz was named Knightstalker), I spent a couple of full afternoons inputting my own tournament games.